Jean-Louis Michau and Patricia de Nicolaï of French niche line Parfums de Nicolaï have published Nicolaï: Parfumeur créateur, un métier d'artiste. The book is written in French and English. Founded in 1989, NICOLAI occupies a unique position within the ‘parfumerie française’ landscape, real pioneer of the alternative High Perfumery. An adventure which could have not been possible without the passion of a couple: Jean-Louis Michau and Patricia de Nicolaï. Together, they have created the company and share the roles since the beginning, each one of them having their own equal part towards development. Refinement, unity, elegance, passion: this book tells the fantastic journey of NICOLAÏ anchored within the great 'parfumerie française' and always looking for the best innovations. 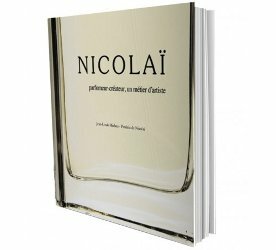 Nicolaï: Parfumeur créateur, un métier d'artiste is 144 pages, and is available on the brand website for €20.